I've mentioned it on my social media channels, but I haven't shared a specific post about it here yet... so here goes! The National Eating Disorders Association found that 70% of women report they don’t like their bodies, and that 89% of women have dieted by age 17. Those numbers should outrage you (whether or not you fall into one of those statistics). So many of us are ashamed of how we feel because society is constantly bombarding us with messages that we aren't skinny enough, we aren't pretty enough, we (as a human being) aren't enough. Well, ENOUGH IS ENOUGH! Obviously running without a shirt on isn't going to change the world over night, but hopefully it will be the first step in shedding our insecurities and realizing that WE ARE STRONG AF! We can do hard things! We may not look like what the media is constantly portraying, but, you know what?! WE ARE MORE THAN BEAUTIFUL! Our weight doesn't define us. Our fastest race time doesn't define us. Our pant size doesn't define us. WE DEFINE US! 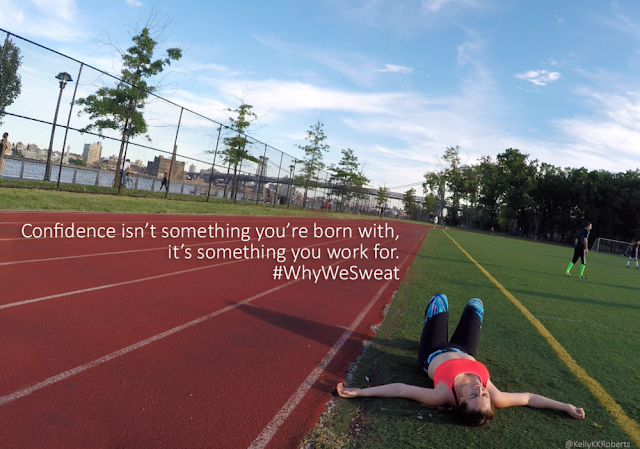 I realize running in a sports bra can be super scary (don't get it twisted, it's taken a VERY long time to be comfortable running in mine... and I'm not even 100% confident most days), but that's what we are here for! We can be each other's #BadAssLadyGang! Let's encourage one another, lift one another up and remind one another that WE KICK BOOTY! I put together a local run, in case any of you are interested in joining me for a fun 3-mile this Saturday. It will be in Encinitas (I thought that was more of a central spot for some of my San Diego friends) at 8am. 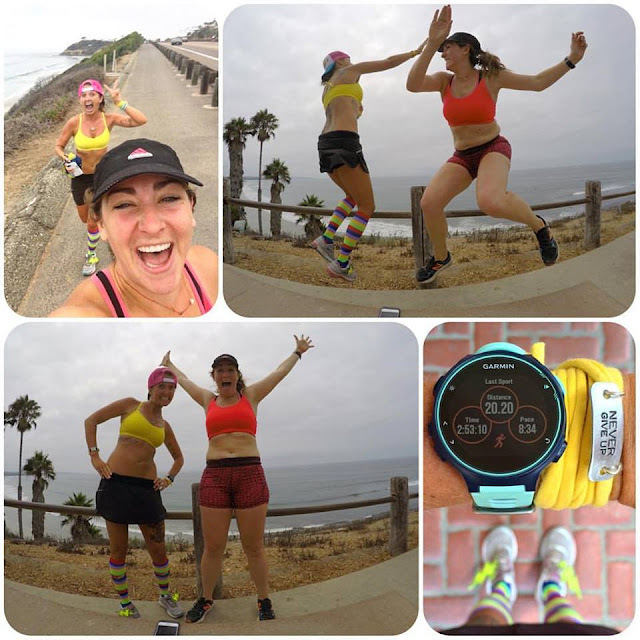 We will meet at Swami's State Beach (there is plenty of free parking nearby) and run to the Cardiff Kook, then spin around and run back. EVERYONE IS WELCOME! Come one, come all (all ages, all paces)! Adults and kids (fur-babies too). Men, we need your support as well (my hubby will be there so you won't be the only one). This isn't just for ladies. Show up for your friends, wives, moms, aunts, grandmas, daughters, godmamas, girlfriends, bosses, coworkers, and women in general. PS Running in only a sports bra is NOT required. If you don't feel comfortable rocking it, that's totally fine (although I urge you to step outside your comfort zone and leave those insecurities behind) - still come get in a few miles with us! Oh yeah, and in case you need a new sports bra - make sure to check out Handful! I love their bras (I wear them while running, swimming, laying out, living life, etc). Use code "CARLEEMCDOT" to save 10% on your orders! In case you want to invite friends, I created a Facebook Event for easy sharing (thanks for helping spread the word). 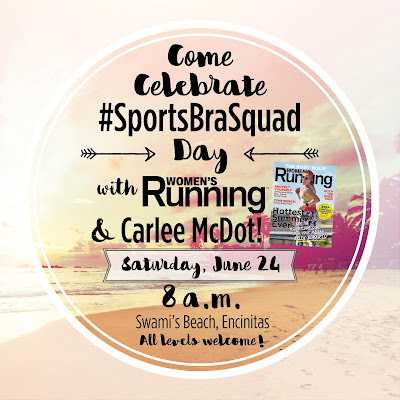 UPDATE: Women's Running will be joining us for our run (and will even have a few copies of July's issue with Kelly talking about the #SportsBraSquad to give out)! Hope to see you all there! 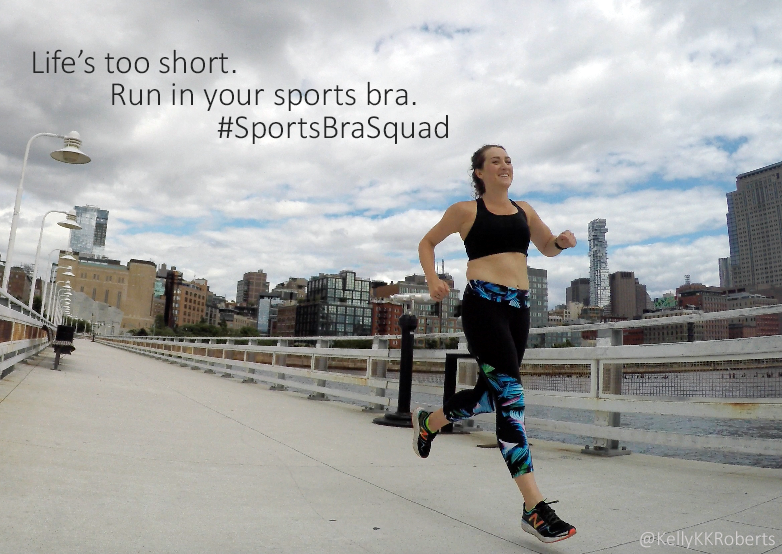 Will you be celebrating #SportsBraSquad Day on Saturday? 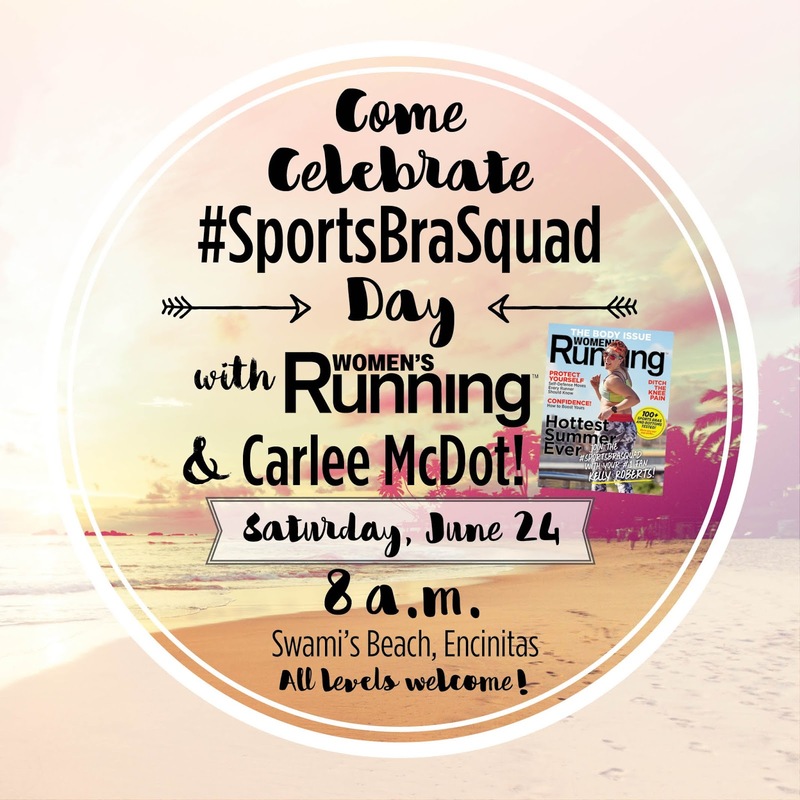 I have a 5K this Saturday so I might run in my sports bra if it's super hot! I'll be in SD this weekend. I'll try to be there!